The real brilliance of the series is in the characterisation and the world that is set up around those characters. The series is set in the distant future. All superpowers except USA and China have gone. People have fled the earth and set up new worlds across other galaxies. This therefore means the people you meet are an extraordinary melting pot of different cultures and backgrounds. The details included are fantastic my favourite being that the characters speak both a mix of English but also Chinese (usually when swearing). I also love each and everyone one of the characters. Captain Mal Reynolds is the lead, a war veteran with a hard exterior but a soft inside which he tries to keep hidden from the world; Jayne Cobb the ruthless mercenary who is in it from the money; Zoe the warrir women and Mal's second in command; Her husband Wash the pilot and comedian of the ship; Kaylee the girly mechanic who sees the best in everyone; Inara the 'companion' who brings class and respectability to the ship; Shephard Book the preacher with a mysterious past and finally Simon and River Tam who are wealthy upper class geniuses on the run from the authorities. The mix of characters is both brilliant as each bring their own separate qualities to the story but they also compliment and mix together well to tell a brilliant story. For me the real tragedy with Firefly is the fact that it didn't go on for longer. 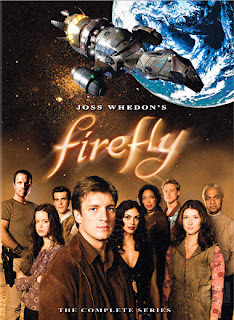 The series was cut short by the network who didn't follow the ideas of Joss Whedon to allow viewers to settle into the series slowly with the original pilot but insisted on the second episode being shown as the pilot which confused everyone at the time. As you watch it you see so many plot line emerging and ideas thrown out there which you just know would have been epic. Serentiy goes some way to address these ideas but there is so much more that could be told and done with these characters. So to cut a long story short go and buy this series. It is on Amazon for less than £12 and will be the best thing you watched this year. I don't think I have ever heard of this series, but it does sound good. YES! I completely agree - I LOVE this series! Oh a fellow Firefly fan ;) This show was canceled way too soon. Stupid Fox, not knowing a good thing they've got. Firefly is one of my FAVORITE tv shows! It's always wonderful to find a fellow Browncoat! I'm with you on this one! I LOVE Firefly and only wish there could have been more than one season.